Dahling Lisa Vanderpump, Leaving Real Housewives of Beverly Hills? After eight seasons,has the Crown grown too heavy for Ms Vanderpump? or has her cast mates had enough? Is she or ins’t she leaving #RHOBH? only her dog Jiggy know for sure. On Reality TV, no man or Vanderpump is an island. If your castmates have had enough of you and refuses to film with you, its OVAH? Its all bout da drama. In October ,when filming of the ninth season began, there were rumors about Vanderpump missing in action. She did not attend Camille Grammer’s wedding with the rest of the housewives. Those rumors were confirmed by castmate Lisa Renna who said on Instagram, Vanderpump hadn’t shown up for work in six weeks. Lisa Vanderpump has had a rough year. In May, her brother Mark, reportedly committed suicide in England. Lisa and Kyle are the pillars of the show. They have been on the show since its premiere in October 2010. Fans wonder if the show can survive the loss of Vanderpump? However, should she leave RHOBH, she will still appear on Bravo on her very popular show Vanderpump Rules. So, if this her final season,we’ll know after the reunion. F-Kanye up? Come on now! A rapper with alleged ties to Snoop Dogg called on the Crips to F.up Kanye West. The order came over Sunday morning in an Instagram video, according to CBS Los Angeles. 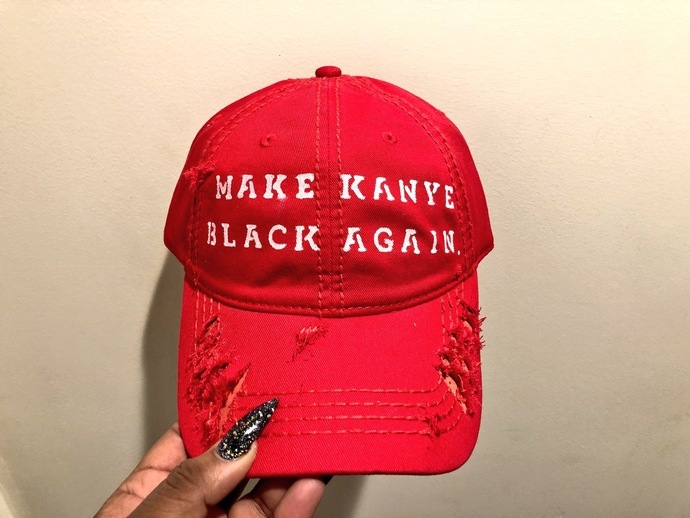 This is all over Kanye’s public support of President Donald Trump. The video has since been taken down. The problem is, some misguided person, just may try to take Kanye West out. We’ve seen this with our current President, who’s I said that, but you got to wrong has resulted in attacks on Muslim’s and other brown skinned people. If he is associated with Snoop Dogg, we can only hope Snoop will denounce the message. You can actually purchase this hat online. There are “Make Kanye Great Again” Tee shirts. Kenya is a proud black man. Kanye West is an American Citizen first and performer second. As a citizen, he is free to join any political party he chooses. However as a citizen and a performer, he risks alienating his fan base. His support of President Trump is curious. Many years ago Mr West called then President George W. Bush racist, due on his lack of support for the Katrina victims in New Orleans. When President Trump and his father has a long history of discrimination against blacks and other minorities and there lies the outrage. I agree with Chance the Rapper, when he says “Black people don’t have to be Democrats “ I think some of his fans might forgive Kanye should he chooses to become a Republican. The outrage is the support of an individual who’s has supported white supremacists, reportedly called African Nations shithole nations and systematically dismantling existing programs that effect LGBT communities and People of Color. Anything new or interesting take place today? I’ve never been a fan of Kanye West his talent is undeniable, I struggle with his narcissism , much like the narcissism of our President. However while I don’t agree with his admiration of Donald Trump, I admire his courage. A few years ago I admired the courage of the Dixie Chicks. You remember the Dixie Chicks. Google um. (Read it Slow) A man who threw a banana peel at Dave Chappelle is suing him. The man was angered by something Chappelle said at show, He threw a banana peel. Englander, who is white, has said he had no racial motivation when he threw the banana peel at Chappelle, who is black, but was angered by something Chappelle said during the show.